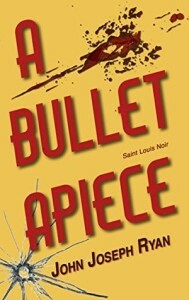 I borrowed a copy of A Bullet Apiece, by John Joseph Ryan, from my local library. It should be noted or disclosed that Ryan apparently lives in my neighborhood. I have never actually met him, but I did once meet his wife and that is how I know about the book. So, hey there, if you’ve found this, surprise, I’m reading John’s novel. All is not well in post-World War II St. Louis, and private eye Ed Darvis, a man pegged as liking justice too much, discovers there’s a fine line between solving a crime and being an accomplice. Ed Darvis, a St. Louis private eye, is pegged as a man who “likes justice too much.” Maybe that’s why business is slow; turns out not everyone in St. Louis is looking for justice. Revenge, deceit, and a little profit-taking on the side are all too often the modus operandi of cops and criminals alike. But when a beautiful woman walks into his bland storefront agency on the seedy side of town and asks him to help find her kidnapped daughter, Darvis’s life heats up. He must use his wits to survive, jabbing and feinting with deadpan directness and cynical ease, and when that doesn’t work, delivering justice with the blunt end of his .38 revolver. 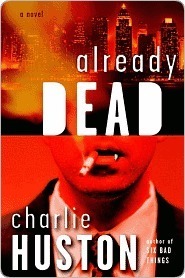 You know, I hadn’t realized it, but I don’t think I’d ever read a true Noir novel before this one. Oh, I knew what to expect. I’ve seen enough Noir movies to know what to expect, but somehow it hits you so much more strongly in writing. And this is important to note, because, though this is really quite well written, I found I couldn’t really like it. It’s dark and gritty, which is usually just up my alley, but it’s also set in 1960 and full of just as much casual sexism (and racism) as you’d expect from the time period, not to mention having two separate horrific crimes both basically predicated on the victimization of women (which I’m just sick of in general, because it seems like 80% of the crimes in books are). And I think this is definitely a characteristic of the genre, rather than any poor choices of the author. But I got very tired of the exaggerated male gaze; every woman is described in reference to her attractiveness or the attractiveness of her parts. In fact, the main character’s attraction to a certain pair of legs starts the whole thing off. And it’s just exasperated by the classic men are heroes women are victims storyline(s). In the end, I just didn’t particularly like Darvis or his worldview. There were things I did like. Again, I thought the writing was fun, especially if you like the Dragnet-like dialogue or the traditional ‘gumshoe.’ The descriptions of Saint Louis are vivid (I happen to live in the Lou) and I really appreciated that it’s diverse. Not all the hookers are women, for example. I didn’t figure out the mysteries, which is something I always appreciate and it’s a stand-alone book. Plus, and I know this is almost irrelevant, but I read the paperback version and I just liked the typeset and binding style of it. So, though I learned a little something about myself and my genre preferences, I can’t really knock the book for falling outside my circle of love. If you’re the sort who enjoys Noir, I recommend picking this one up, because the only true faults I found are personal pet peeves, not quality issues. It seems very true to what I expected out of a Noir novel. This entry was posted in books/book review and tagged book review, mystery, noir, Saint Louis author on March 4, 2016 by Sadie.